In the early 17th century, Korean artists introduced porcelain to Japan marking the beginning of a new art industry and trade. 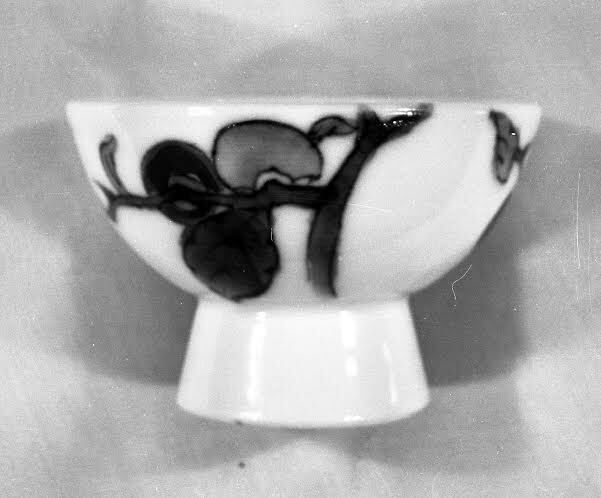 Porcelain is formed by the use of touseki, a white clay, which is heated to extremely high temperatures to form ceramics, as seen in this sake cup. This sake cup, created in the 19th century, shows the exquisite craftsmanship of Japanese artisan Senzan, with a blue plum branch decoration on the exterior. The plum branches were painted with a blue underglaze and red decorative glaze to enhance the look of the ripened plums. The plum branches and fruit were most likely depicted due to their prevalence and use in Japanese culture and use in food and drink. This sake cup would customarily be used for dinner parties or personal use within the home. Sake is fermented rice liquor unique to Japan and dates back more than two thousand years. When drinking sake, it is customary for individuals to pour the alcohol for their companions before accepting a drink themselves. By pouring alcohol for others rather than oneself, it creates an atmosphere where everyone is a guest and serving one another. It is a way of showing community as well as putting one’s enjoyment before your own.